For your general questions and comments about Ken Boxer Live, including comments about this website, please submit the following form. 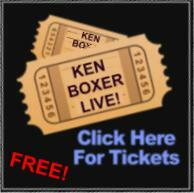 A Ken Boxer Live representative will respond to you within 24 hours. If you wish to cancel a ticket request, you may do so here. Please provide us with the name of the guest appearing on the show for which you wish to cancel.